Easy to bake chocolate cookies using only 4 to 5 ingredients! Bake these for your family members or you can even gift these to your friends. We all love chocolate, right? We are chocolate fans since our childhood. We love to eat chocolate bars, chocolate ice cream, chocolate tart, and of course chocolate cookies. Chocolate cookies are one of the most loved cookies in the world. 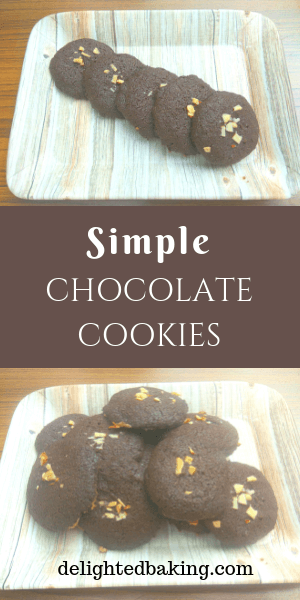 From simple chocolate cookies to chocolate chip cookies, chocolate chunk cookies to chocolate almond cookies; you will find at least one chocolate cookie variety that you would become a fan of! By the way, if you are vegan, do try these chocolate walnut cookies from The Fiery Vegetarian. These cookies are vegan and naturally coloured. So cool, right? Make sure you check out this recipe! Today we are going to learn an easy chocolate cookies recipe. 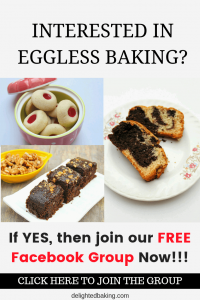 This recipe is eggless and it requires only 4 to 5 ingredients. You can eat these chocolate cookies along with a cup of tea. You can also give these chocolate cookies to your relatives and friends. They would love to have these. Chocolate cookie is one such recipe which every one likes to bake. 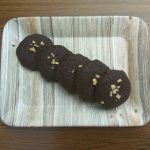 How to make eggless chocolate cookies? We will be using either ghee(clarified butter) or butter for making these cookies. So, firstly we will beat powdered sugar and ghee(or butter) together. I would recommend you to use either a hand mixer or a stand mixer for mixing the ghee(or butter) and sugar together. If you do not have either of these, then you can use hand whisk. Just remember to beat it for a little longer than the mentioned time. The next step is to mix all the dry ingredients together. The dry ingredients of the recipe include all purpose flour, cocoa powder, semolina(suji). And the final step is to mix the dry ingredients and the wet ingredients together. Mix them properly so that a nice dough is formed. We will keep this dough in the fridge for some time. This step would ensure that the cookies do not spread out too much while baking. After taking out the dough from the fridge, we will make small balls using this dough. Flatten the balls a little bit. You can also decorate these cookies a little bit, if you want. You can add chopped almonds or pistachios on the top. This would enhance the look of the cookies. Take ghee / butter and sugar in a bowl. Mix them properly till the sugar gets properly dissolved in the ghee/butter. You can either mix them using a hand mixer (or a stand mixer) or simply with a spatula. Seive maida, cocoa powder and sooji (semolina). Now keep this dough in the fridge for half an hour. Press these balls a little. You can top these cookies with chopped almonds .